What’s Wrong with Industrial Oils? It’s not like industrially-processed oils are useless. Canola oil makes a great lubricant for machinery. And seed oils are currently being studied as alternatives to nonrenewable petroleum products for everything from fueling cars to making plastic to formulating printer ink. But you know what soybean, canola, and other seed oils aren’t so great for? Human consumption. Unlike actual vegetables, “vegetable oils” are not nutrient-dense whole foods. In fact, they’re so far from whole foods that you might wonder why we even tried eating them in the first place. So here’s the story of how vegetable oils took over the US food supply, and why that’s not such a good development after all. People at the beginning of the 20th century were beginning to get more and more worried about the unsanitary meat production facilities of the day; vegetable oils were easy to sell as cleaner and more “pure” because they weren’t associated with meat production. Because they’re made from agricultural surplus, seed oils are very cheap for the consumer – just compare a bottle of canola oil to a bottle of olive oil. The anti-saturated-fat campaign starting in the 60s and 70s endorsed (and still endorses) seed oils as healthy alternatives to lard and butter. By the middle of the century, “vegetable oils” were cheaper than traditional fats, widely available, and being trumpeted as “healthy choices” from every side – is it any wonder that they took off? Here’s a chart showing the change in consumption of a few fats over time. 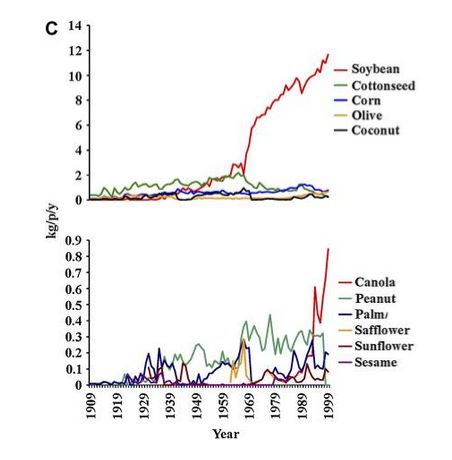 Notice the giant spike in “shortening” (read: seed oils – this is Crisco et al.) 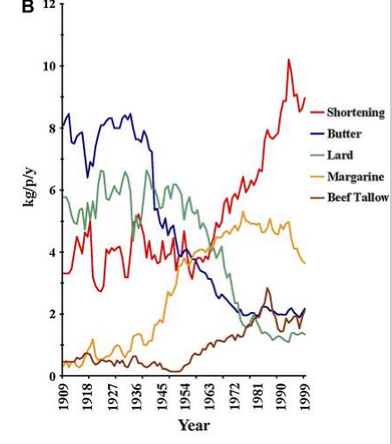 and Margarine and the precipitous decline in butter and lard. 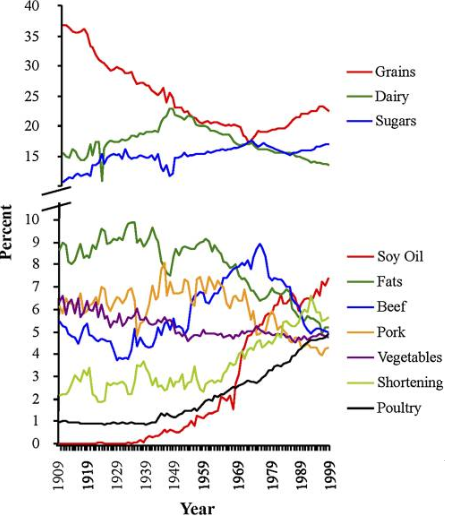 Notice that consumption of beef, pork, and total fat dropped off, while consumption of soy oil in particular, poultry, and “shortening” (again, think margarine and Crisco) rose. Supposedly, this ought to represent a more “heart-healthy” diet – but rates of heart disease have been climbing steadily the whole time. More Seed Oils: So What? It’s true that canola and soybean oil taste like nothing at all: based on culinary value alone, they never should have replaced deliciously luxurious traditional fats like lard and butter. But the consequences of seed oil’s rise to power are much worse than tasteless food. The rise of seed oils caused a dramatic change in the nutritional composition of the American diet. Specifically, seed oils contain high amounts of a type of fat called Omega-6 PUFA. (Need a refresher on types of fat? Go here.) 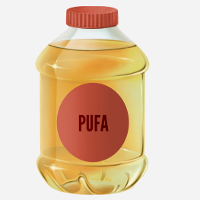 Traditional fats like lard and tallow contain some Omega-6 PUFA, but seed oils are a much richer source. This study looks at food available (not necessarily what was eaten, but what was in the food supply) and found that availability of Omega-6 fats skyrocketed between 1909 and 1999. The number one source: soybean oil. So what’s so bad about that? Omega-6 fats aren’t “bad” in the abstract. In fact, we need a very small amount of them to live; that’s why they’re called “essential fatty acids.” But we don’t need nearly as much of them as we’re getting from all that canola oil. Omega-6 fats are chemically less stable than other types of fat. They break down easily under stress – especially when they’ve been exposed to heat, light, or oxygen. Think about how we get our vegetable oil: first it sits out in a clear plastic bottle on the shelf, then it’s heated during cooking (sometimes multiple times, in the case of deep-frying). This causes a kind of damage called oxidation. Oxidized fats are highly inflammatory and contribute to oxidative stress (you can read more about this here) and inflammation. That goes double when Omega-6 fats are hanging around without their buddies the Omega-3s. Omega-3 fats. The ideal ratio of Omega-6 to Omega-3 is somewhere between 1:1 and 4:1. Between 1909 and 1999, the actual ratio of Omega-6 to Omega-3 fats in the American diet increased from 5.4:1 (that’s close to ideal) to 9.6:1 (getting into scary territory). That’s not a list of diseases most people want to experience firsthand! Obviously, all of these conditions have contributing factors other than Omega-6 and Omega-3 fats. But the inflammation caused by excess Omega-6 and an imbalance of Omega-6 and Omega-3s isn’t helping anything. As “health foods,” seed oils just don’t live up their promises. 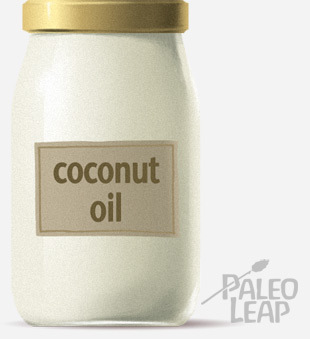 If you want a cooking oil, try coconut or olive oil. Seed oils (or “vegetable oils,” if you like the marketing term) just aren’t the answer to anyone’s health problems, least of all heart disease. Seed oils are a very convenient way to dispose of agricultural waste via potato chips and deep-fried Twinkies, but they’re not doing any favors for your body. Instead of eating a bunch of industrial seed oils, maintain a healthier balance of Omega-6 and Omega-3 fats by filling your plate with fish, traditional animal fats, butter, or healthy plant fats like olive and coconut oil (not all fats made from plants are unhealthy). They’re much better for you, and the taste alone is enough to make anyone swear off canola for life.